Do you want to know how long it’s been since I’ve been to More Than Just Ice Cream? I was trying to remember, and it’s been so long, I didn’t remember. It had to have been in the 90’s. Seriously, it was that long ago. What I do remember is that I went for brunch and that it was good. A whole slew of us went one morning on a lovely day. With every brunch entree, you get a complimentary mimosa. How can you not love that? There’s tons to choose from and you get plenty of food. The french toast, topped with apples and served with a side of canadian bacon. This was an impressive dish. 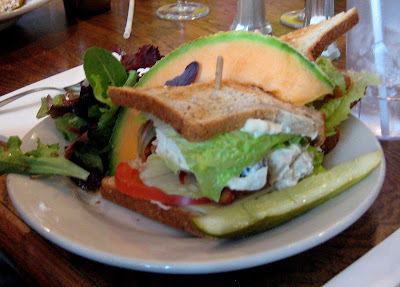 The chicken salad sandwich, with heaping mounds of chicken salad, a side of greens, some cantaloupe, and a pickle. J enjoyed this sandwich quite a bit. I was a bit jealous of it. The last time I was here I had gotten the eggs benedict. I wasn’t going to mess with this. Once again, it was quite delicious. 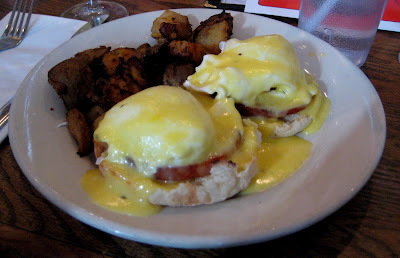 Canadian bacon on english muffins, topped with poached eggs and hollandaise. It was served with a healthy helping of home fries. It’s good to know that dish was still good here. For those that had room, some ice cream was also had. I was stuffed, so I had to pass. Service was ok. They were just a bit slow. And it wasn’t super crowded or anything, so there was no excuse for it. He was nice though, and we weren’t in a hurry or anything, so it wasn’t the hugest deal. We were just real hungry, is all. The mimosa is a nice touch though. Takes your mind off the fact that you’re waiting quite a bit.